There's a snow Goose in my bathroom! I have been enthralled with making these improve hashtag blocks this past week. Check out Gefilte quilts blog post on how to make them here. She has a few different ways to do them. Mine are the first method. So fun and quick to make! Then to the bottom of the eye and I like it better. Today I'll do the binding since it is snowing/ sleeting with blustery cold winds and I'm not going anywhere. Guess what March 17th is? International quilting week end and free show week end on thequiltshow.com! Series 100-1700 will be open to everyone for 3 days. All you have to do is register and sign in! There are lots of good ones - here are a couple I have on my list as must see. Not much art quilting done because I've spent the past week patching holes and tears on an old well loved king sized dutchmans puzzle quilt. There was a gapping hole right in the middle so I seam ripped out a block from a corner and appliquéd that in the middle where it shows and patched the hole, then put that in the corner slot. I thought that was it but then upon looking I started seeing a lot of this. Old fabric shreds after years of use unless the quilt is kept in a climate controlled vault somewhere but what good does that do? I believe a quilt should be used. So not one to do a job half - assed, I ended up free motion quilting the geese in the offending blocks like this. It took me awhile but was enjoyable " tv watching time" work. Our crazy spring continues - on Sunday it was 70 degrees and tonight it's going to be 10 below zero! 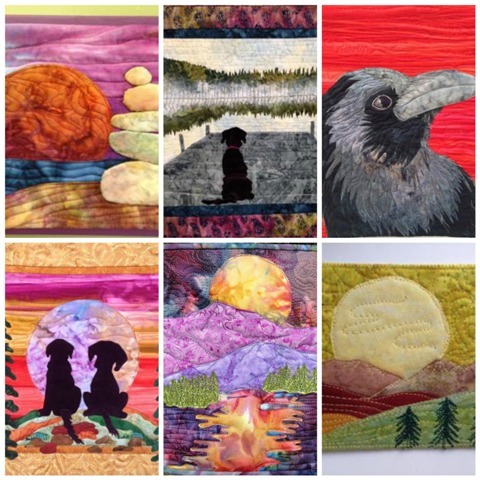 Next week I am participating in a blog hop where you pick an artist and make a quilt inspired by that artist. Can be any art form including writers. I am doing Laurel Burch who you probablly know as a textile designer. I'm sure you have owned at least one of her designs at some point. Her style is uniquely her own.